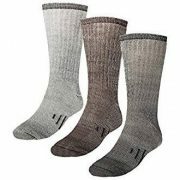 Fashionable, just casual or sporty looking, most bootie slippers for men all have one common feature that makes them especially useful for people who suffer from cold feet and ankles when trying to relax in the comfort of their home. 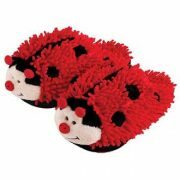 Bootie slippers keep those toes and ankles nice and toasty while also looking stylish. 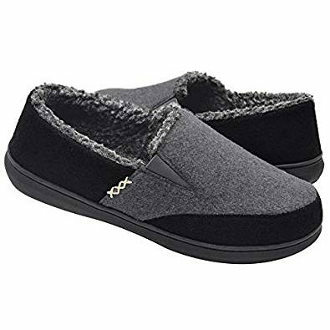 They also work a lot better than common slippers for short or even longer trips out when the temperatures are freezing cold, keeping your feet cozy and protected. Here, we have selected to review some of the best bootie slippers for men that gather top user reviews in terms of quality, looks and usability. 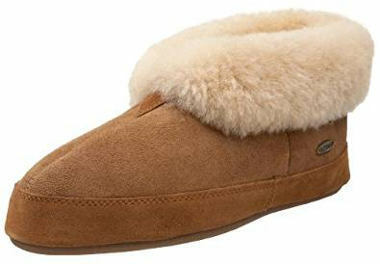 These Bootie Shearling Slippers for men look very warm and comfortable. They feature suede leather uppers and indoor/outdoor rubber soles as well as a split toe. 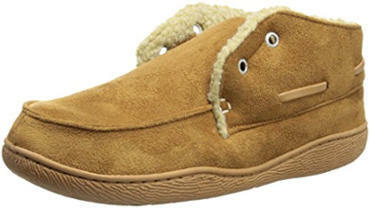 They have a nice memory foam foot bed and genuine shearling lining with a folded ankle cuff. In addition, they come in sizes 7-16 and three distinct colors; allspice, rootbeer and black. 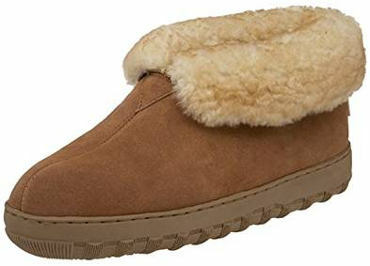 The upper is handsewn and the inside is fully lined with furry shearling fleece. You can also turn up the collar so that more of the ankle can be covered. Users find these nice booties to be well constructed, soft, warm and comfortable. 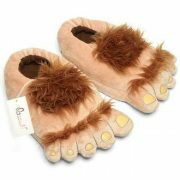 They have sturdy soles and conform well to the shape of your foot. These Sorel Bootie Slippers for men are modern and beautifully stitched. They look like a shoe and come in two color options, Marsh and Bark. Other features include soft leather uppers, a breathable and warm wool blend faux fur fleecy lining, a rubber sole and a whip stitch moccasin toe. The EVA insole is removable and there is a debossed side logo. 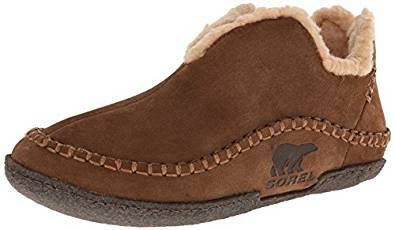 Users really like the sturdy sole and say that these Sorel’s booties are durable, well made and warm. 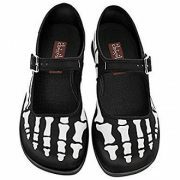 They break in easily and are increasingly comfortable, offering some good arch support. 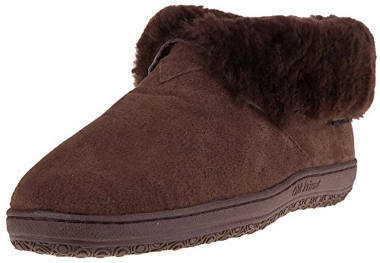 Made from sheepskin with a soft suede upper, furry lining and a rubber outsole, Acorn Men's Sheepskin Bootie slipper is a well made, durable and very warm bootie to go for. 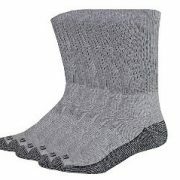 There is also a ribbed knit cuff and a memory foam midsole that makes this footwear comfy. Made in the USA, it comes in sizes 7-13 (unisex sizing) and in your choice of walnut or black. 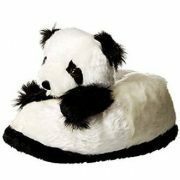 Users like the fit of these slippers and find them to be durable, comfortable and warm. They also like the fold down cuff as well as the non-skid bottom and say that the insole is nice and cushy. 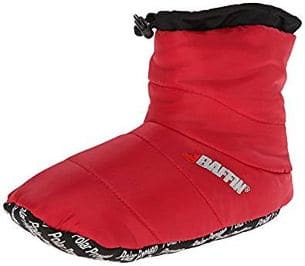 If you like camping outdoors when the temperatures are low or you need a really warm and comfy pair of bootie slippers, then the Baffin quilted slipper will keep your feet conveniently warm and comfy, giving you that cozy feeling of a sleeping bag like slipper with lots of room in the toes. It comes in sizes small, large and extra-large and several very nice looking colors. 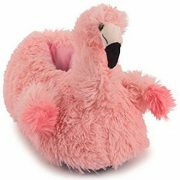 These sporty bootie slippers consist of a textile upper with a drawstring closure and a flexible synthetic outsole that is only suitable for indoor use. There is also an embroidered logo on the vamp. Users review that the Baffin insulated booty is easy to put on and get off. 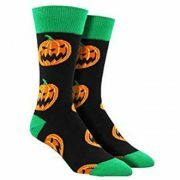 It really keeps their feet and ankles warm while still being comfortable to wear. Some people compare these booties to having a sleeping bag for their feet. They also like the fact that they fit well and are lightweight. Nevertheless, there were also some negative reviews about the sole being too thin and not being durable enough by the end of just one season. 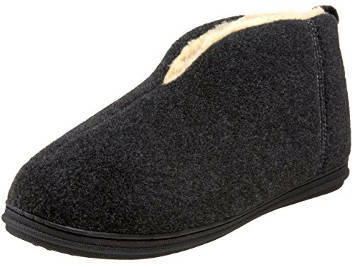 This boot style slipper by Slippers International is made from a fabric that has similar features to the ones of wool such as durability, softness and breathability. It comes in sizes 7 through 16 and your choice of charcoal, brown, tan or navy. The fabric upper is lightweight while there is a faux shearling lining, a padded insole and a slip-resistant rubber outsole that is good for both indoor and outdoor use. Users like these booties because they are good looking, heavy duty, warm and comfortable. They are also sturdy with excellent lining and don´t make their feet sweat. They stay on the feet and most users recommend ordering a size up because they run small. 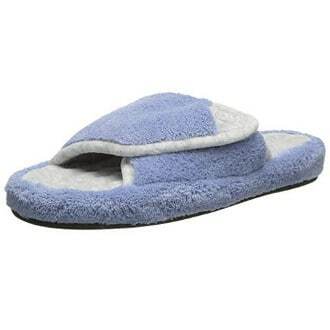 This Old Friend Men's slipper comes in sizes 7 through 13 and 6 great colors. 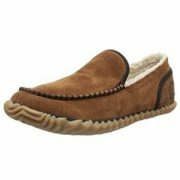 It features a suede pigskin upper with sheepskin lining, a padded insole and a rubber outsole. It also has a collar which you can unfold to cover your ankle. The fur is dense and feels cozy. Some people find that it takes a few weeks for this bootie to loosen up. 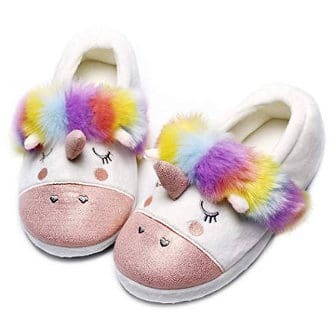 In general, users like the fact that these leather bootie slippers are very durable, comfortable as well as warm and they have decent arch support. They also have nice thick soles that stop the cold from coming through to your feet. 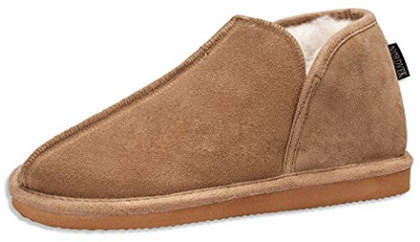 These stylishly casual slipper boots by Dockers have polyester uppers, a synthetic sherpa lining, which feels soft and warm, and an indoor/outdoor outsole. They also have a 2 eyelet pattern and a memory foam cushion. They are easy to put on and get off, and come in sizes 8-9 and 13 as well as your choice of either tan or brown. 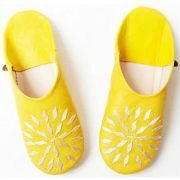 Users like the quality of workmanship in these slippers and the fact that they stay on their feet when walking. They are also well made, comfortable and light weight. 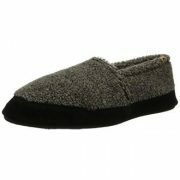 These fun slipper boots look like sneakers and come in sizes 7 through 12 and in your choice of black, blue or gray. They look fluffy and very warm. They are also lightweight, featuring a memory foam foot bed and a TPR bottom. The outsole is soft and durable but not suitable for outdoor use. 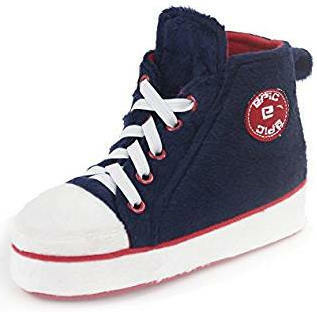 These sneaker slippers are fun to wear and have comfortable elastic laces. 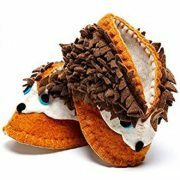 Users say that they look adorable and they are super comfy. Some people find that the heel is a bit high and say that it took them a little time to get used to it. This Nordvek Bootie looks like an elegant and good quality slipper to wear. It is available in one color and sizes 7 through 13. 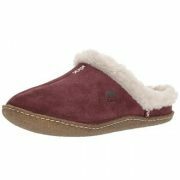 It features a hard non-slip outsole and a sleek outer made from suede sheepskin. It has a blend of wool and sheepskin lining and is suitable for outdoor wear. Users are very pleased with the quality of this footwear and say that it fits well. It is also very warm and the design looks great. 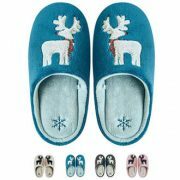 In conclusion, if you are looking for a really warm, stylishly casual and sturdy pair of slippers, this review has included some of the best bootie slippers for men for you to more easily find what suits you best.